So it's Indiana that takes the ball and runs with it. The Supreme Court opened the door for the "religious freedom" excuse for state-sanctioned discrimination last summer with the Hobby Lobby decision. At the time, Court-watching pundits warned that the decision would empower right-wing Christians to write their bigotry into law. Then came the waiting game: which state would be the first to extend a sanctimonious middle finger to the gay community? The answer came this week, as Indiana Governor Mike Pence signed a bill giving business owners the right to refuse service to persons who offend their religious sensibilities. If you've followed this blog since its inception two years ago, you know I've had some very harsh things to say about Christianity. I've railed against the institutional cowardice that holds denominations back from implementing the clearly subversive intent of the Gospel, mourned the anti-Judaism essential to the New Testament, and ridiculed Biblical literalists and their bizarre attachment to stories of God-induced mass extinction. You'd be justified in thinking I'v got quite an ax to grind when it comes to religion, whether organized or grass roots. In fact, this has been a long time coming. I grew up in the church, son of a Methodist minister, and was myself (and, technically, still am) a member of the Methodist clergy. Although I had grown increasingly disenchanted with church bureaucracy, ossified theology, and with the unrealistic expectations of the profession, I ultimately left for personal reasons: I just wasn't happy being a pastor, and it showed. Since my departure from ministry fifteen years ago, I've been wrestling with how I feel about the church, about faith, about the nature and even existence of God, and much of that has appeared in this space. One thing I've never had to wrestle with, though, is how I feel about the holy bigots who fill so many pews. I never liked them, and now I'm finding their intolerance intolerable. When I was a pastor, I had to put up a diplomatic front when it came to homophobia. Even during my three years in Estacada, serving a progressive reconciling congregation that welcomed sexual minorities into its midst, I kept my public pronouncements conciliatory. All that's needed, I assured both my congregation and the civil rights group I worked with, is for the good people of Estacada to get to know some gay people, realize how much they have in common, and how hurtful their discriminatory practices are, and this corner of the world will change for the better. I believed that then, and I believe it now. What I'm not so sure about is whether the world will change fast enough to avoid another round of the Culture Wars. Two weeks ago, the Presbyterian Church (USA) took the step United Methodists have been avoiding for decades, declaring itself open to both ordaining and performing weddings for persons with same-gender sexual orientation. I was delighted to read about this, though I quickly discovered what had made this move possible: seeing the writing on the wall, the conservative Presbyterians who had fought the move for so long had finally either died off or just left the denomination entirely. As a United Methodist district secretary told me once, "Sometimes for the church to move, people have to die." Enough had died or left that the balance shifted, and the church did the right thing. And now the bad news: when I searched just now for information on the decision, I came up with this story, in Charisma News: "34,000 Black Churches Break Ties with the Presbyterian Church." In fact, as the story relates, it's one organization that represents a number of historically Black denominations that has done the tie-breaking, but the discouraging message is accurate enough: plenty of Christians who take scripture and tradition seriously believe they are called to reject the full inclusion of gay people. It's a true watershed moment, a President signing legislation that expands rights for millions of Americans who've been oppressed and discriminated against for centuries. 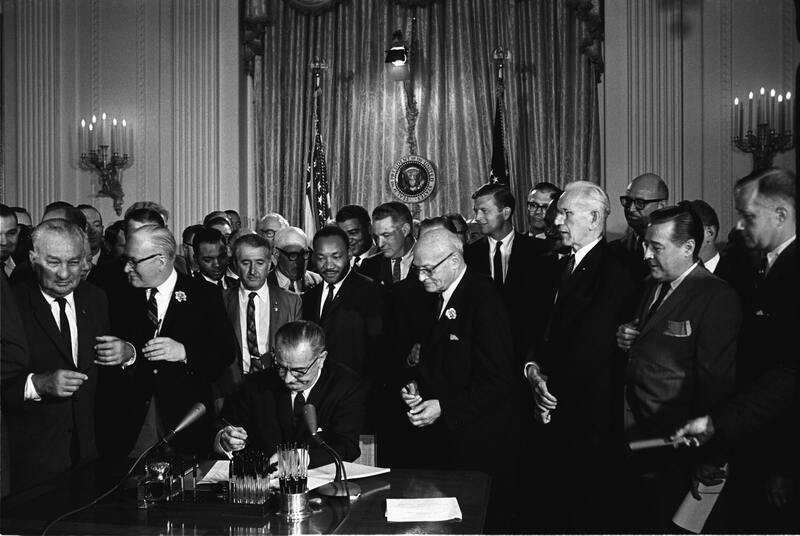 This bill, and its companion, the Voting Rights Act of 1965, set the standard for historic laws. This legislation expanded rights, protected marginalized people, and created penalties on business owners who would discriminate against them by refusing them service for no reason other than that they found the color of their skin offensive. It's a perversion of history, then, to create a similar occasion around legislation that does the exact opposite: protect business owners from penalties for refusing service to persons for no reason other than that they find their sexual orientation offensive. Calling it "religious freedom" is Orwellian. This is nothing short of state sanctioned bigotry. It creates protections for the religiously intolerant. I don't expect it to stand. Within hours, Indiana found itself the target of a boycott that will cost it millions. It has become the object of national ridicule. Large corporations are reconsidering decisions to locate offices and production facilities in Indiana, the NCAA may pull its basketball championships, and the hashtag #boycottindiana is picking up millions of followers. Apart from public disdain, the measure is inherently unconstitutional. Whatever the Indiana state supreme court does with it, it will almost certainly be struck down by the US Supreme Court, especially as business owners are beginning to boast that of course this is about discrimination, not liberty. The question for the state of Indiana is simple: can its legislature admit its made a horrible mistake and repeal the act? Or will it wait until it is forced to do so, thus proving to all the world that it will only do the right thing when it has no choice? And really, Indiana, Charisma Times, "Good News," Ted Cruz, and every other self-described Christian, Jew, or just plain religious person who is being dragged kicking and screaming into the diverse world in which we all live: what do you honestly think God wants you to do when a gay man or woman walks into your business and just wants to buy something like anyone else? As you spew hatred toward such people, can you really believe that you're without sin, and thus equipped to cast the first stone? Or is it time you took the log out of your own eye, and just practiced common decency?